How Do You Take Your Parents on a Trip When Traveling Doesn’t Seem Possible? You need a break. You want to bring your parents on a trip, but you’re not sure it’s possible. They can’t walk fast. They get lost easily. How can you travel with aging parents without feeling stressed the entire time? If you book a cottage or suite that has multiple bedrooms and one door, the chances of your parents wandering off alone are reduced. Set the locks and put yourself in the closest bedroom between the exit door and their bedroom. With a suite or cottage, people have their own space too. Many have two or more bathrooms, so no one has to share. Privacy is maintained, but you’re all in one unit. You want time to yourself. You don’t want your parents going off on their own. Does the hotel or resort offer some guided tours? Sign your parent up for a tour and go off and do your own thing while they’re away. Some establishments offer senior programs. Your parents will go on tours and join activities with others their age. You could also consider a cruise. Senior discounts can make this an all-inclusive way to travel. Cruise ships are ADA-compliant, so your parent’s mobility issues won’t matter. Plus, there are doctors on board if there is a medical issue. With a cruise, there are activities geared towards children, young adults, and older adults. Everyone has activities that suit them, and you can also spend time together when you reach a port. 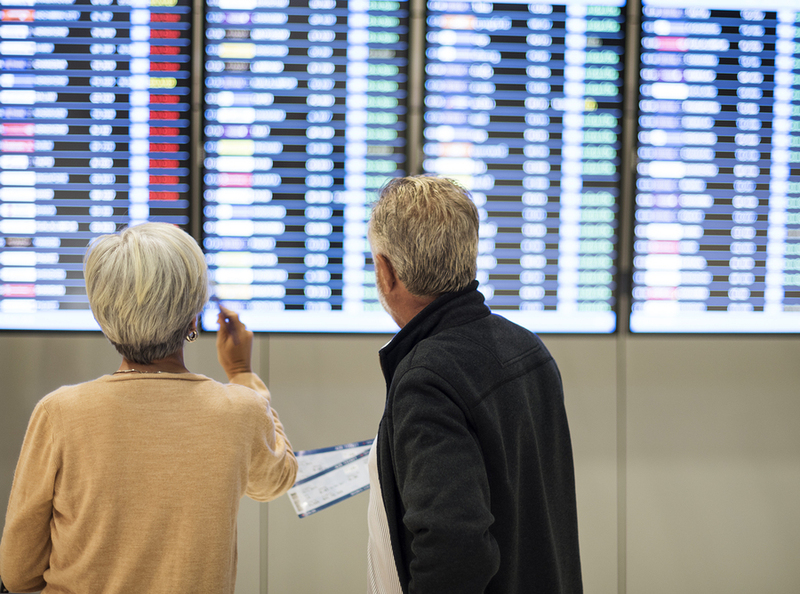 If you have a flight with connecting flights, it may be challenging to get your parent from one gate to another in time. If mobility issues are present, call the airline and ask for a wheelchair. Instead of walking slowly, you can push them to the next gate. You may need a note from your mom or dad’s doctor explaining why there is an issue with mobility. Flight assistance can also be helpful if your parent has dementia. While you stand in line to check in, someone can sit with your parent and keep them from wandering off. If you’re the main caregiver, it can seem hard to take a vacation without your parents. It is possible, however, with elder care services. Let caregivers help out with respite care. With this elder care service, caregivers take over for you when you’re away. Your parents level of care doesn’t change, but you’re able to get away and relax. They still have rides to appointments, reminders for medication, and meals prepared for them. Call an agency to talk about your travel plans.